WASHINGTON, DC - NOVEMBER 15: U.S. Surgeon General Jerome Adams testifies before the Senate Health, Education, Labor and Pensions Committee in the Dirksen Senate Office Building on Capitol Hill November 15, 2017 in Washington, DC. Adams testified about community-level health promotion programs and businesses that offer incentives to employees that practice healthy lifestyles. 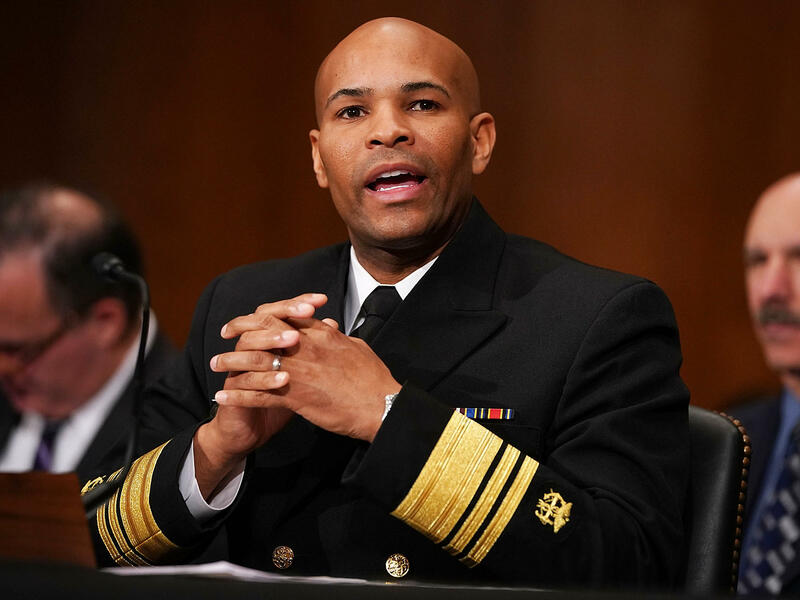 Surgeon General Jerome Adams is recommending that more Americans be prepared to save people from opioid overdoses. "The call to action is to recognize if you're at risk," he tells Morning Edition's Rachel Martin. "And if you or a loved one are at risk, keep within reach, know how to use naloxone." Police officers and EMTs often have naloxone at the ready. Access to the drug for the general public has been eased in the past few years, too. The medicine is now available at retail pharmacies in most states without a prescription. Between 2013 and 2015, researchers found a tenfold increase in naloxone sold by retail pharmacies in the U.S. But prices have increased along with demand. Naloxone-filled syringes that used to cost $6 apiece now cost $30 and up. A two-pack of naloxone nasal spray can cost $135 or more. And a two-pack of automatic naloxone injectors runs more than $3,700. And while it's true that naloxone can prevent many opioid-related deaths, it doesn't solve the root cause of the problem. So where does this fit into an overall strategy for tackling the opioid crisis? NPR's Martin asked Surgeon General Adams about the advisory, and the administration's broader plan for addressing the opioid epidemic. Here are interview highlights that have been edited for length and clarity. We should think of naloxone like an EpiPen or CPR. Unfortunately, over half of the overdoses that are occurring are occurring in homes, so we want everyone to be armed to respond. We're working with pharmacies, providers and medical associations to increase training on how to administer naloxone in homes. But overall — and I'm an anesthesiologist who's administered naloxone many times myself — it's very safe, easy to use, and 49 of 50 states have standing orders for people to be able to access and to use [naloxone] in the home setting. When a person is having multiple overdoses, I see that as a system failure. We know addiction is a chronic disease, much like diabetes or hypertension, and we need to treat it the same way. We can't have someone overdose and send them back out onto the streets at 2 a.m., because they're going to run right back into the hands of the local drug dealer. If you come in at 3 a.m., having been resuscitated from an overdose, we need to have either an immediate access to treatment available for you, or, what's working well in many places is a peer recovery coach — someone who's been through this before and who can speak to you in a language that will resonate, and basically can be with you until you're in recovery. Those are the kind of systemic changes we need to make sure naloxone is a touch point that leads to recovery. President Trump has asked for, and Congress has approved, $6 billion in funding to respond to the opioid epidemic. There are different grants available for states to purchase naloxone, which they can give out for free. Affairs, are actually able to get naloxone with little or no copay, and we're working with them to make that copay as small as possible. We're also working with Adapt Pharma and Kaleo [two makers of naloxone available in the U.S.] to try to keep costs low. From an economic point of view, unfortunately, there are so many people who need naloxone that drug companies are going to make their money one way or the other. We are not going to solve this crisis without the involvement of law enforcement. I can also tell you, from visiting many communities, that folks are concerned about public safety aspects. One neighbor is concerned their son is overdosing while another other neighbor is worried their house is getting broken into. I'm focused on meeting with the attorneys general and meeting with local law officials and making sure that if you're dealing drugs, you're going to go to jail. But if you have a substance use disorder, we're going to give you an option to get treatment, and hopefully become a productive member of society again. This starts with naloxone — saving lives is one of the president's key pillars — and then using it as a bridge for treatment. Fifty-million dollars in funding has been allocated specifically for naloxone, and states are eligible for $2 billion in block grants that they can use however they like. If we can spend money on prevention and more treatment options, making sure we're providing wrap-around services, I think we'll find ourselves in a good place. I continue to impress upon folks the importance of partnering, making sure that law enforcement is sitting down with health and education so they all put their money together on a local level. At the end of the day, unfortunately, there will never be enough money in the federal government to do everything that we want to do. The opioid crisis continues to ravage many communities in the U.S., so much so that the U.S. surgeon general says Americans should be as prepared to handle an opioids overdose as they would be to administer CPR. Today, the surgeon general is issuing an advisory, urging more Americans to carry the medication naloxone. It's also called NARCAN, and it's the drug first responders used to reverse an opioid overdose. I spoke to the U.S. surgeon general, Vice Admiral Jerome Adams, about why ordinary Americans should be prepared to prevent someone from dying from opioids. JEROME ADAMS: Over half of the overdoses that are occurring are occurring in homes, and so we want everyone to be armed to respond. We should think of it like an EpiPen or like doing CPR on someone. MARTIN: Is there any kind of risk in having everyday Americans armed with naloxone? I mean, is it difficult to administer? Are there any risks of administering it incorrectly? Do people need training? ADAMS: One of the things that we're doing is working with pharmacies, working with providers, working with the American Medical Association and the nursing associations to increase training on how to administer naloxone in homes. But overall - and I'm an anesthesiologist who's administered naloxone many times myself - it is easy to use, and 49 out of 50 states have standing orders for people to be able to access and use naloxone in the home setting because it is a safe drug where the benefits definitely outweigh the risk, particularly in the midst of an epidemic. MARTIN: What about paying for it? I mean, this is a medication that costs around $40 a dose, I think. The company has doubled the price in recent years, one of the primary manufacturers. Some devices that you use to administer naloxone cost as much as $600. And, I mean, there is no limit potentially on what individual pharmaceutical companies can charge, right? ADAMS: I've spoken to the president about this personally, and both he and I are determined that the cost of naloxone will not be a barrier to folks being able to have access to it. MARTIN: How do you ensure that? ADAMS: Well, there are many different ways. No. 1, the president has asked for and Congress has approved $6 billion in funding to respond to the opioid epidemic - more than has ever been approved in history. There's $50 million in funding that has been allocated specifically for naloxone. No. 2, we're working with insurers. Ninety-five percent of people who have insurance coverage, including Medicare, Medicaid and TRICARE in the VA, are actually able to get naloxone at little or no copay. And we're working with them to make that copay as small as possible; and then finally, work with Adapt Pharmaceuticals and Kaleo, the two makers of at-home naloxone, to make it easier for individuals to access naloxone at low or no cost. MARTIN: What's their incentive to keeping the price low? Will they just do it because you tell them it's the right thing to do? ADAMS: Well, I hope that that's part of it. I know that these companies - I've met with the presidents, and they want to do the right thing. But also strictly from an economic point of view, unfortunately, there are so many people out there that need naloxone that they are going to make their money one way or the other. And I think they want to do the right thing. They just want to do it in a way that helps them sustain their bottom line. And they can do that. We can cut the price significantly and still make money for them and save lives. And that's what we're trying to do. MARTIN: Is it possible to incentivize other companies to create generics of naloxone so that there is low-cost competition? ADAMS: Again, we're looking at all possibilities. But right now, we have two really good FDA-approved products, and we're focused on making them available at low or no cost to as many people as possible. And I think from the federal side, from the insurer side and from the pharmaceutical company side, we've got some great potential to do that in short order. MARTIN: You describe this measure, making naloxone more readily available, as a tourniquet, as a life-saving measure. You acknowledge that the key, though, is figuring out what to do with that person after this emergency crisis. Yes, you can administer this and they can live another day, but how do you make sure that person doesn't overdose 24 hours later? ADAMS: Well, folks want to say unfortunately in far too many cases that the individual has failed. But when a person is coming in from multiple overdoses, I see that as a system failure. We know addiction is a chronic disease, much like diabetes or hypertension, and we need to treat it the same way. So I'm focused as surgeon general on making sure everyone sees addiction not as a moral failing but as a chronic disease and that we have good, evidence-based treatment, including medication-assisted treatment, available for individuals with a warm handoff right from the overdose. We can't have someone overdose and then send them out onto the streets at 2 a.m. because they're going to run right back into the hands of the local drug dealer. MARTIN: Explain that moment, the warm handoff moment. ADAMS: That warm handoff means that you come in at 3 a.m. in the morning having been resuscitated from an overdose, and we have either an immediate access to treatment available for you or what's working well in many places, including Rhode Island where I just visited, is a peer recovery coach, someone who has been through this before and who can speak to you in a language that will resonate and will basically be with you until you can get into recovery. MARTIN: The Trump administration has talked a lot about the opioid crisis, has tried to make it a priority in combating it. The president himself has spoken a lot about law enforcement as a mechanism to do that and the need to go hard at drug dealers. What do you think about that? And what about the dealers who are in the business because they themselves are addicts? ADAMS: Well, I can tell you from personal experience, I lived this in Indiana when I was the state health commissioner there. We are not going to be able to solve this crisis without the involvement of law enforcement. And I can also tell you from visiting many communities that folks are very concerned about the public safety aspects of this crisis. One neighbor is concerned that their son is overdosing. The other neighbor's concerned that their house is getting broken into. And so it's not either or. It's got to be both. And what I'm focused on is meeting with the attorneys general, meeting with the local law enforcement officials, making sure that if you're dealing drugs and you're putting people at risk, you're going to go to jail. But if you have a substance use disorder, that we're going to give you an option to get treatment and hopefully become a productive member of society again. 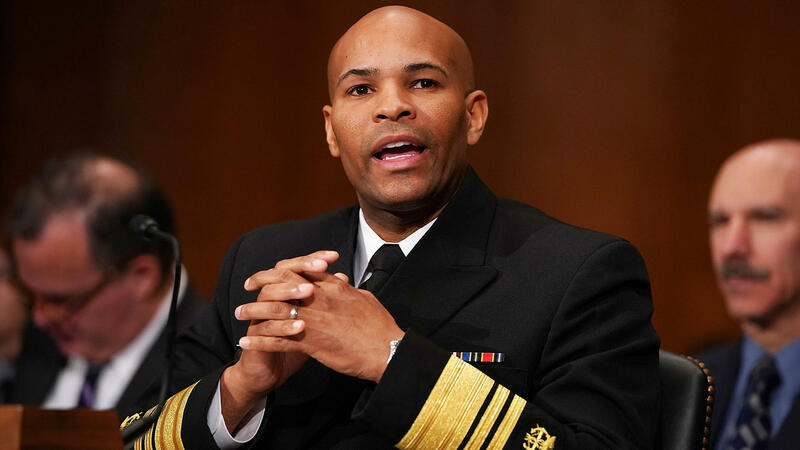 MARTIN: Vice Admiral Jerome Adams - he is the U.S. surgeon general. Thank you so much for your time, sir. ADAMS: Thank you so much, Rachel. (SOUNDBITE OF SLEEP DEALER'S "THE WAY HOME") Transcript provided by NPR, Copyright NPR.